All trips are open to anyone interested in birding, wildlife watching, and exploring Florida's natural areas. Fees for reserved trips must be received in advance to insure a reservation. Please note that if you are not a current Chapter Only Member, the fee to attend our field trips is $20 per person. For all trips, please bring binoculars, bird/nature guides, water, snacks, and sunscreen. Wear comfortable walking shoes (no flip-flops!) and a hat, and please note that some trips may require shoes to get wet. Please remember to walk and speak quietly during the outings so as not to frighten the wildlife. Arrive at least 15 minutes prior to departure times to sign in. Walkie-talkies will be provided this year on outings, but please be sure to return these to the trip leader before departing. Car pooling, when possible, is appreciated. All trips are subject to rescheduling or cancellation due to inclement weather or other unforeseen circumstances. Please note that all trips require registration so our trip leaders know how many to expect. Trips are open to anyone interested in birding, wildlife and outdoor exploring. 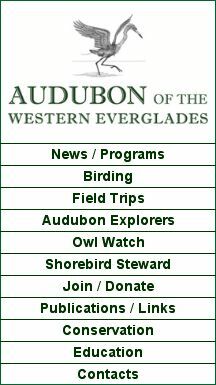 The fee for each trip is $10 for Audubon of the Western Everglades members and $20 for everyone else unless otherwise stated.